Charles, AD7UF, finally has a new HF antenna to supplement his venerable coax-fed 75M electric fence wire dipole, issued by the Civil Air Patrol, for whom he does radio communications (and was recently appointed commander of our local squadron). 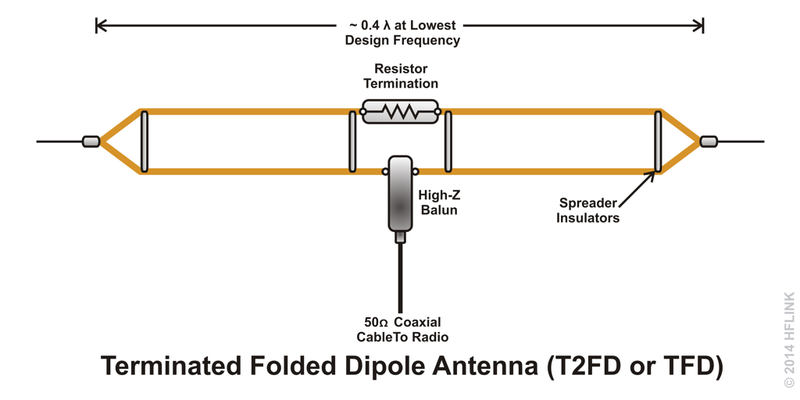 The antenna, model AT-FD90-800 from Alpha Tech, is a 90ft folded doublet with a big fat terminating resistor. Having an antenna of another length with a different radiation pattern was a definite need at my place, particularly for 40m, where due to the high impedance and no transformer between the mast and my shack, 100ft of coax ate 99% of my signal. The resistor is the magic in this antenna, though. On frequencies where the impedance of the radiating system is high, the resistor absorbs the extra energy, wasting it as heat (bad) and presenting a reasonable impedance, that is then transformed by a balun to roughly 50 ohms that the rest of the system likes. Less than 2:1 VSWR from 2-30 MHz without a tuner. Contrary to the wild claims you may hear about such antennas, it's not going to miraculously work every frequency better than any other antenna. It's a "Jack of all trades, master of none". Its performance below 5 MHz is decidedly inferior to my other wire in most cases where I've tested, but it does quite well around 7 MHz, which used to make my radio huddle in agony and terror. The real beauty (and the reason that CAP uses them) is that my radio can switch between bands very quickly without stopping to re-tune. I am now able to operate true ALE, not the "I'm listening but you're only going to reach me on this channel" kind that I've been running for the past couple of years. The flexibility of being able to jump to a frequency and instantly join a conversation is outstanding. I've been able to make a lot of contacts that I would've missed with my other antenna because either I couldn't tune it fast enough, or the performance was just too poor for that particular QSO. Sure it's a compromise antenna; all real-world antennas are compromises. But when you see an antenna that offers a theoretical 3dB or even 13dB (2-20x) loss over another, realize that the remote station location vs. radiation pattern and the variation in atmospheric propagation, especially, often means received power variations of 1,000,000:1 (60dB) or more. Bottom line: Don't be afraid of an "antenna for dummies" or other compromise antenna. Which antenna's going to net you more QSO's: the one that gets used, or the one that doesn't? The page where that drawing came from has a lot more information on this and other antennas used for frequency-agile applications.